A guitar for percussive slappers and tappers? A true do-it-all guitar. If you only have one, consider making it this. Punchy tone, understated good looks, and a great pickup system. You could find a similar spec for a little less. 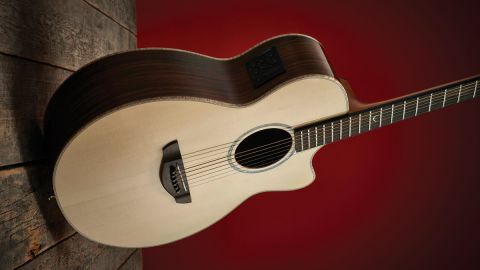 When Faith Guitars launched in 2002, you would have been forgiven for thinking Patrick James Eggle an unlikely large scale acoustic manufacturer. Not only was he best known for boutique electric guitars, Eggle’s previous attempt to scale, Eggle Guitars, had ended with him falling out and leaving the business, so on two fronts, Faith seemed like, if you’ll forgive the pun, a leap of faith. Sixteen years later, doubters have resoundingly been proved wrong, as Faith have gone from strength to strength and are now to be found in most guitar shops, with a very strong offering in the mid-price range. In some ways it has stuck to the knitting, keeping to fairly traditional looking guitars that won’t startle the horses, but there’s always been a strand of innovation and exploration to what they do. Here, it has taken the bestselling Venus model, and boldly responded to the trend towards percussive slapping and tapping in fingerstyle by adding a body sensor. Early into the “design it here, build it there, set it up here” approach to building guitars abroad, Faith does things right, and the Venus Percussive is no exception. The very pale Engelmann spruce top is finely grained and wonderfully cross-silked; it certainly feels like a high-end piece of wood, and the gorgeous flame maple binding adds to the luxurious feel with lots of shimmer and lustre. The rosewood back and sides (Indonesian, we assume) is chocolatey and deliciously striped, with a beautifully bookmatched pale section in the centre of the back on our review example, bound once again in lustrous flamed maple. Faith keeps the adornments simple and clean without ever sacrificing the sense of high quality and the single, simple abalone ring around the soundhole epitomises this, glittering without feeling ostentatious. The bridge and fingerboard are of ebony, and look at first glance to be stained, deep, featureless black, but on closer examination, the figuring of the ebony is visible. There’s a compensated Tusq saddle, and ebony bridge pins with mother of pearl and brass inlays to continue the feeling of high end luxury. The mahogany neck has 20 frets, and the only adornment on the fingerboard is the stylised mother of pearl F at the 12th fret, leaving a mostly blank canvas of ebony right up to the Tusq nut. The headstock is faced in rosewood with an inlaid MOP Faith logo and Grover Rotomatic tuners with black buttons to tone in with the rest of the instrument. Finished in high gloss as the name suggests, the guitar is very handsome, jumping out of display racks by dint of the very pale top and spare, classy adornments, and in common with all Faith instruments, it’s beautifully executed. There’s nothing to find fault with, the guitar feels light and resonant, and little details like the coachlining purfling even on the sides, the rosewood heelcap and the strap button on the neck heel all give a sense of a guitar both well thought through and well executed. The star of the show in some ways, and the thing which differentiates this from the standard Hi Gloss Venus, is the Fishman Ink body system and head unit. This pairs an undersaddle piezo with a body sensor similar to the hotspot pickups the likes of K&K make. The controls on the head unit allow you to independently control and mix the output from each pickup, which should make for a better acoustic tone full stop. The idea of targeting this at percussive players seems to come from Faith rather than from Fishman, and whether it will prove a masterstroke or instead push this guitar into a backwater of limited appeal remains to be seen. As with every Faith guitar we’ve played, the Venus is well set up straight out of the provided hard case. The neck is a typical C shape, slim enough for speed, but not excessively tiny, and satin finished for comfort. The body is a good compromise between comfort and projection, with a decent amount of soundboard, but a not-too-daunting waist for smaller players to reach around. As you would expect from spruce and rosewood, it’s full toned, bright at the top, punchy at the bottom, with a little less richness in the midtones than a mahogany-bodied guitar. It’s the essence of what a spruce and rosewood auditorium guitar should be; strum it hard and it punches out with confidence, pick it gently, and the crystalline treble rings clearly and prettily. Intonation is excellent across the board, and this feels a particularly balanced guitar, responding dynamically to changes in pick attack without requiring you to think too much about controlling the bass response, for example. Of course, this guitar is really all about the plugged-in performance, and there it doesn’t disappoint either. We have the Fishman Ink system on another guitar, with the undersaddle pickup only, so we know it to be a good capable system, but this adds a further dimension. There’s a large tuner display, and the expected volume and three band EQ (all the controls are inconspicuously black and flush), plus a notch filter, a brilliance control, and a separate ‘body’ control. If we understand the controls correctly, the main volume manages the overall output, the undersaddle pickup remains at a constant level within that, and the body control brings in more of the body sensor. Starting with the body control down low, you get what you would expect from a decent undersaddle unit; it’s not perfect, but the tone reflects the acoustic sound fairly well, and with a little EQ tweaking, you can get what you want. There’s a little piezo quack, but not too much, and then, as you dial in the body pickup, you get a slightly more rounded sound; the quack dies down a little, and you get a tone which, if not a perfect reflection of the acoustic tone, has a slightly more 3D feel to it. As far as the percussive stuff, the body pickup certainly seems to capture in particular open-handed slaps on the soundboard better than the undersaddle unit. The ability to control body response certainly helped to get the overall volume up without causing feedback, and to balance the tone between the percussion and the strings. Overall, it’s a pretty useful tool. This is an excellent all round performer’s guitar, with or without the body sensor. It’s a great deal at just over £1,000, and competes with Taylors that are significantly dearer. Great for your front room, and a reliable partner when you plug it in. The Ink Body pickup is a great selling point whether you play percussive guitar or not, and my slight fear is that by aiming at that limited but growing market, Faith will stop other players looking at this guitar. It is great for percussive playing, but it’s far more than that, and if you’re looking for an auditorium size guitar for live work, you should try one of these even if you never slap or tap at all.